The Latvian Federation of Australia and New Zealand (LFANZ) is active in areas that reflect it’s goals to promote Latvian culture, support and coordinate Latvian organisations in Australia and New Zealand, and the wider world. LFANZ works with the Republic of Latvia’s Community Inegration fund, the Cultural Ministry, Foreign Ministry and other international organisations. ‘Hello Latvia’ is an American Latvian Association (ALA) project where teenagers between 13 and 15 years of age travel around Latvia learning of it’s culture, history and geography. This project is designed for teenagers who speak Latvian, but live abroad. Previously LFANZ has financially supported participants with half the airfare and half the cost of participation. From 2015, LFANZ will continue to provide financial support to participants with ALA participation costs only. LFANZ may also provide support to an adult companion, if requested by ALA.
Further information can by found at ALA homepage. The trip to Latvia with ‘Hello Latvia’ gave me a good impression of Latvia and the whole trip has left me with long lasting memories and strengthened my identity as a Latvian. This trip has strengthened my Latvian identity. I have friends in the USA, Canada and Latvia for life. I can’t wait to participate in the Youth festival, Cultural festival and even maybe the Song Festival in Latvia in 2018. If you would like to request support for ‘Hello Latvia” , please contact us. In 2015 a container full of donated books was sent from Australia to Latvia. These books, written in Latvian, were sent to libraries, hostels/nursing homes, schools and museums. If you would like to donate your Latvian language books, please contact your state representative. The next container is expected to be sent in 2016. LFANZ has supported a number of camps in Australia over many years. Presently the camps in Australia are Annas Ziedares Summer High school, 3 x 3, and Tervetes children’s camp. In 2016 all the camps will be held during January. Annas Ziedares Summer School (AZVV) camp is held at the Latvian property “Dzintari”, in South Australia. The camp is held over 3 weeks and is for teenagers from 13 years of age who speak Latvian. Click here for more details. 3 x 3 is a camp that is held in various locations around Australia. The aim is to strengthen the Latvian identity for those living abroad and for Latvians of all ages. Further information about the 2016 camp available here. 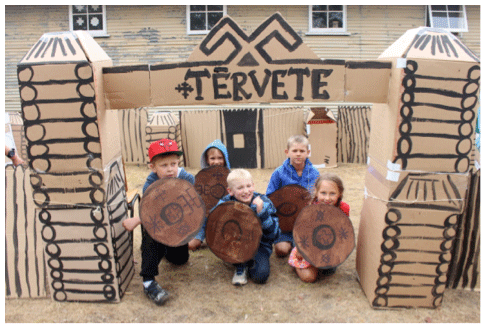 Tervetes children’s camp is held at the Latvian Guide and Scout property, about an hour’s drive from Melbourne. This camp, held over one week, is for children from the ages of 7, that speak Latvian or would like to improve their Latvian. Further information please call Zinta Walter-Bruns or click here. The Vitolu fund administers scholarships to Latvian students who would otherwise not be able to attend tertiary education in Latvia. The LFANZ through the Vitolu fund donates a scholarship to talented students in need of support with their University studies. The LFANZ each year invites a guest speaker to tour Australia (and possibly New Zealand) to address formal Latvian community functions celebrating Latvia’s Proclamation day. The LFANZ Executive council and representatives in each community work together to ensure the successful co-ordination of this initiative. The LFANZ is grateful for the contribution of Latvia’s Community Integration fund (SIF) supporting visitors from Latvia for this event. The LFANZ maintains a community calendar for all Latvian organisations in Australia and New Zealand. We hope through this calendar that both large and small organisations will be able to advertise their events, thereby reducing the administrative load. If you wish to advertise your organisations events in the community calendar please contact us. The LFANZ awards Certificates of Recognition on Latvia’s Proclamation Day celebrations to those Latvians who have shown persistent efforts in promoting LFANZ aims. Previous people who have been awarded the Certificate of Recognition. The Cultural branch initiates, promotes and strengthens education of the Latvian language and the development and preservation of Latvian culture. The school section co-operates with Latvian schools and co-ordinates their activities, arranges the supply of educational materials, and organises conferences for parents and teachers. In conjunction with the Further Education Section, it is responsible for the preparation of new teachers for Latvian schools. The Further Education co-ordinates all Latvian post-school education. It deals with all those aspects of Latvian education that do not involve the Latvian Ethnic Schools. It oversees the operation of the “Tervete” children’s camp, “Anna Ziedare” summer school and the “3×3” camp. The handcraft section is responsible for maintaining contact with Latvian craftspeople. It works for the preservation and development of Latvian folkloric designs, promotes the formation of handicraft groups and associations, organises seminars and displays and develops collections of Latvian artefacts. The musical section is responsible for maintaining contact with Latvian musicians and composers, promotes the development of Latvian choirs and attends to other matters related to Latvian music including the organisation and promotion of concerts by Latvian musicians. The theatre section attends to matters relating to theatre, the development and preservation of Latvian theatre, and promotes the organisation of Latvian Theatre Festivals. The visual arts section is responsible for maintaining contact with Latvian painters, graphic artists, sculptors and others working in the field of Latvian visual art. It promotes Latvian art and organises exhibitions. The science section is responsible for maintaining contact with Latvian scientists, for promoting the recognition of professional qualifications obtained by Latvians overseas, encourages the undertaking of research projects and deals with problems covering any branch or field of science in which Latvian scientists are involved or which concerns the Latvian people or their country. The post graduate studies section is responsible for arranging opportunities for suitable university graduates from Latvia to do post-graduate studies at tertiary institutions or associated facilities in Australia. The folk dancing section promotes the development of Latvian folk dancing groups, their co-operation and interaction. The film section is responsible for maintaining contact with Latvian film producers, promotes the documentation on film of important events in Latvian society, and organises Latvian film archives and exhibitions. The literature section is responsible for maintaining contact with Latvian authors and others active in the field of Latvian literature, and promotes the development of Latvian literature.